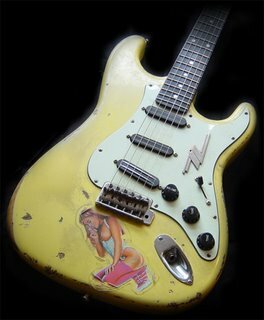 A Strat For FRIDAY !!! Friday!! The Day of the Eagle!! Here's yet another submission from wild man Glen in Milan. Our first Friday Strat -- which I guess has just automatically obligated me to do one of these every Friday from now till eternity. This means all YOU out there send me your pics!!! Remember, you get some promo out of the deal too! Our debut here is in my opinion the perfect Friday Strat. 1) The chips, dings and dirt represent the week you just survived. 2) The color is the light cheerful feeling inside that comes every Friday! 3) The hot pickups are for the adrenaline surge as you blast out of your job at quittin' time. 4) The chrome ZZ Top emblem means there's Good Rockin' Tonight! 5) Oh yeah, the chick decal. This is what you see in the club parking lot late Friday night. A chick talking on her cell phone as she's peeing behind your car. HAVE A GREAT WEEKEND KIDS!! !